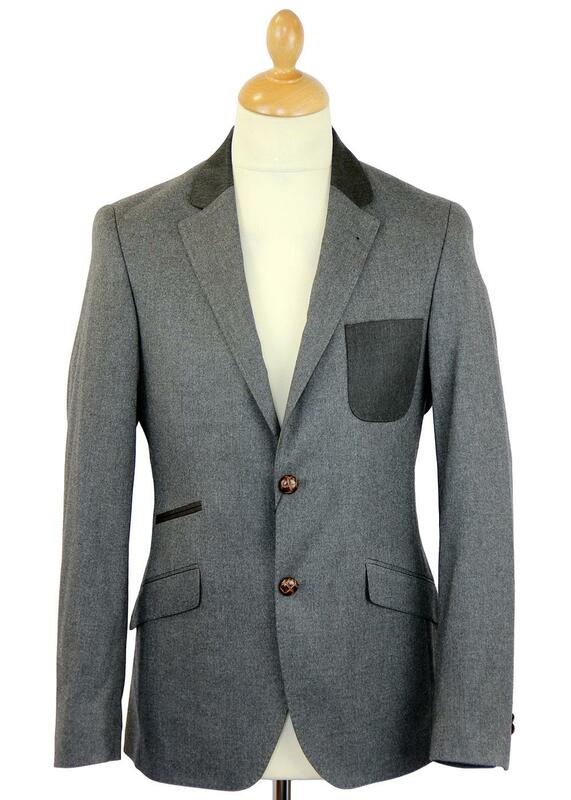 GUIDE LONDON MENS RETRO SIXTIES CONTRAST COLLAR AND POCKET MOD 2 BUTTON BLAZER (Grey). Tailoring by Guide London - A stylish Mens single breasted blazer jacket with Retro contrast trims and desirable slim Sixties Mod cut. A simple 2 button fastening and Retro notch lapel, with a final touch of Vintage football buttons. 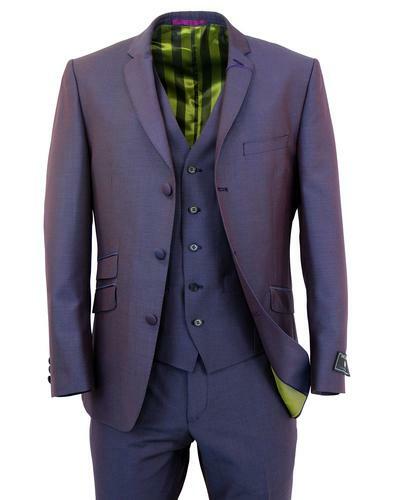 Dress in style this Autumn/Winter with the Guide London 2 Button Contrast Collar Blazer Jacket. 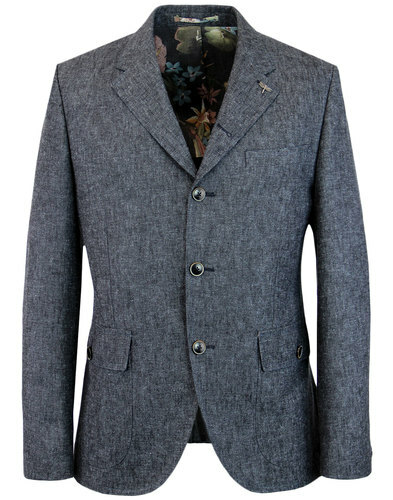 This Guide London grey tailored Mod 2 button blazer features a cool Retro contrast collar and chest pocket detail. Suave and sophisticated with Sixties Mod slim notch lapel, Retro jetted ticket pocket which is a nod and a wink to the traditional dinner jacket and the Americana Tux vibe. Finished with exquisite Retro contrast lining in deep red. 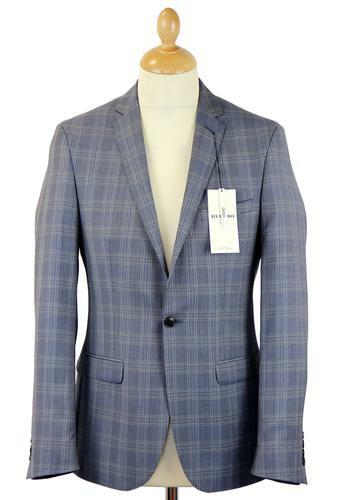 Guide London Mens 2 Button Contrast Collar Blazer Jacket. Side vents to back, two flap pockets and finished with cool Retro Seventies football buttons for a that touch of Vintage flair. GUIDE LONDON MENS RETRO SIXTIES MOD 2 BUTTON CONTRAST COLLAR BLAZER JACKET. Composition: 50% Polyester, 49% Viscose, 1% Elastane. Lining 1 48% Viscose, 52% Acetate. Lining 2 50% Polyester, 50% Viscose. SKU: JK3038 Guide London Blazer. 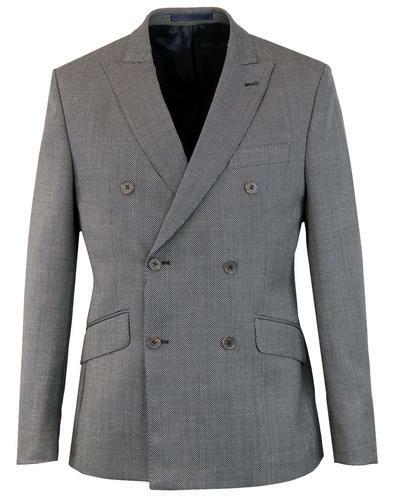 Guide London Mens Retro Sixties Mod 2 Button Contrast Collar & Pocket Blazer (Grey).